So, we’ve finally made a decision on our summer holiday for this year. Joe and I going for somewhere a little different, somewhere we’ve never been before… the beautiful greek island of Mykonos. 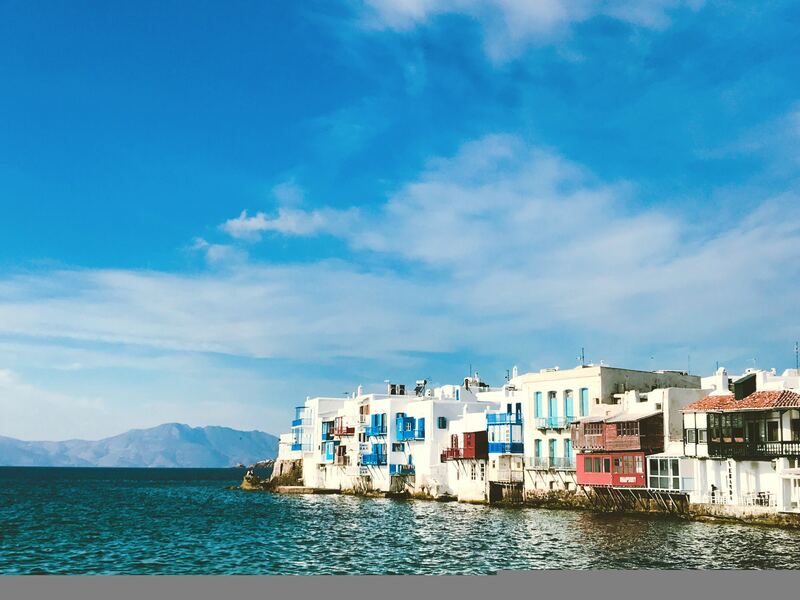 One of my best friends has been recommending Greece to me for years, she’s scouted out many of the greek islands on her travels and sent me a long, very helpful list of recommendations. From those recommendations came the island of our choice – and it wasn’t for the island’s party reputation! 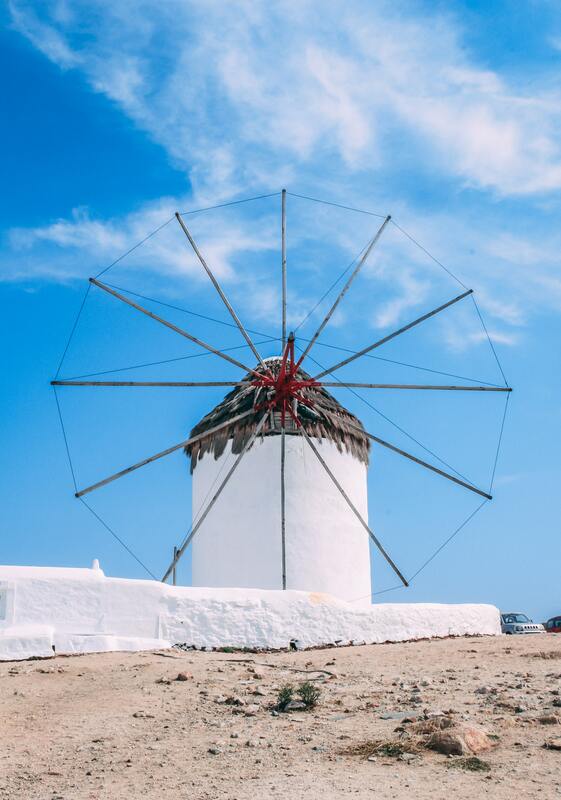 Situated in-between the Alefkandra and Neochori areas, the seven remaining windmills stand on a hill overlooking the sea and Little Venice area. Each one has been painted a bright white to fit in with Mykonos town’s buildings but contrast beautifully with the blue Aegean Sea and skies. 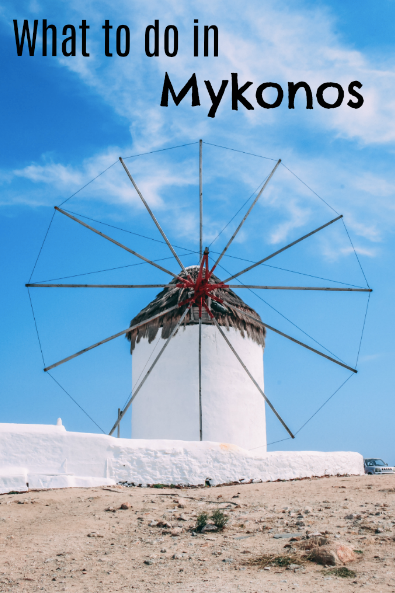 Known as the ‘Island of Winds’, a trip to Mykonos wouldn’t be complete with a visit to its famous windmills. Dating back to the 16th–19th centuries, local agricultural farmers used the wind power and mills to grind their wheat and barley. The flour that was created was provided to local family bakers. Sailors used to stop on the island to collect husks, or bread that can be stored for a long time, to satisfy them on their seafaring journeys. Giora’s Wood Bakery is one of the oldest that still remains on the island, using traditional methods. Top tip: Visit first thing in the morning to avoid large swathes of tourists during the day and at sunset. We’re quite lucky, we’ve chosen a hotel that is between two beaches as we primarily picked Mykonos as a relaxing summer holiday – for once! Mykonos has 25 beaches to its names, complete with golden sand and transparent turquoise waters. Southern beaches are known to be busy, bustling and booming with music, the beaches in the North are quieter and more like coves with their own privacy and calm nature. We have Korfos beach just a few minutes north of our hotel, a beach often chosen by surfers, kite surfers and wind surfers, due to its strong winds and crystal clear waters. 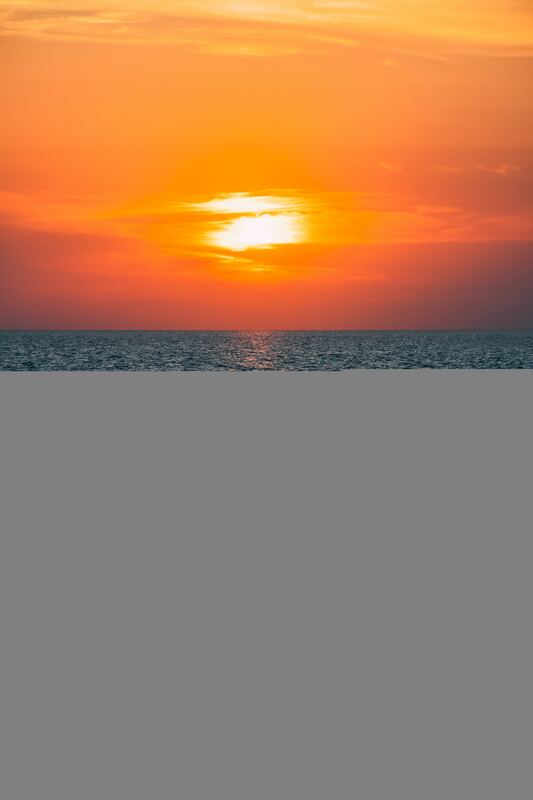 However, when the wind is calmer this beach is often relaxing, especially when it comes to watching a sunset or two. We also have Ornos beach to the south. A scenic beach with soft sands and very clear waters for sun-worshipping, it sits infront of a traditional fishing village with its own local seafood restaurants. It comes complete with sun loungers and umbrellas at a daily rate, whilst you take a dip. However, it can get quite crowded during the peak season, which is why we’ve opted to go out of season for the quieter atmosphere. Top tip: Apart from the main beaches, tiny coves can be sought out if you’re a keen adventurer and enjoy diving. Second to the beaches is Mykonos’ central town. Lined with vibrant bougainvillea and picture-perfect tiny churches, restaurants and boutiques, this town is worth a wander alone. Nowhere is this better represented than in Little Venice, with its town buildings literally hanging over the sea. Whether you visit at sunrise or sunset, the light bounces off each building and onto the water, making it an iconic spot within town. It’s here you’ll find some of the island’s oldest occupations, for example, weavers have been a staple of the island with over 500 being worked on a daily basis. Today, only two remain. Hunt them out in Little Venice and you’ll be greeted with beautiful hats, scarves, blankets and clothing. A real highlight behind the harbour front is Matoyianni Street, which has back-to-back designer boutiques full of handmade leather sandals and bespoke costume jewellery – if you have the cash to splash. Other handcrafted local shopping highlights are evil eyes and mosaic art. Undeniably, one of the main reasons to visit here is for its food and unforgettable sunsets. A lot of the restaurants in Mykonos town are set around the harbour and offer Greek and Italian-flavoured menus that excel in fresh fish and barrelled wine. Deeper in to the town, there are souvlaki shops and crêperies like the renowned Jimmy’s Gyro, plus bakeries that produce local specialities like almond-based cakes and cheese pies from ovens straight out of the Middle Ages. The perfect way to finish off any day in town is with a sunset drink at The Belvedere. Cocktail in hand and a picturesque view overlooking all of Mykonos is a must. Top tip: Take a selfie with Mykonos’s mascots – its pelicans–- in homage to Petros the Pelican, the original from the 1950s. Built in 1891, this lighthouse can be found on the north-western tip of Mykonos offering views between Tinos and the island itself. The lighthouse was designed as an octagonal cylindrical stone tower, with lantern (that still flashes every 10 seconds) and gallery. Take the north coastal road passing through both Stephanos and the Houlakia Bay area for a scenic, beach-laden drive and then enjoy a minor hike for some of the island’s most incredible ocean views. Top tip: Rent a car and stay for the sunset. Less tourists make the journey to this secluded spot. 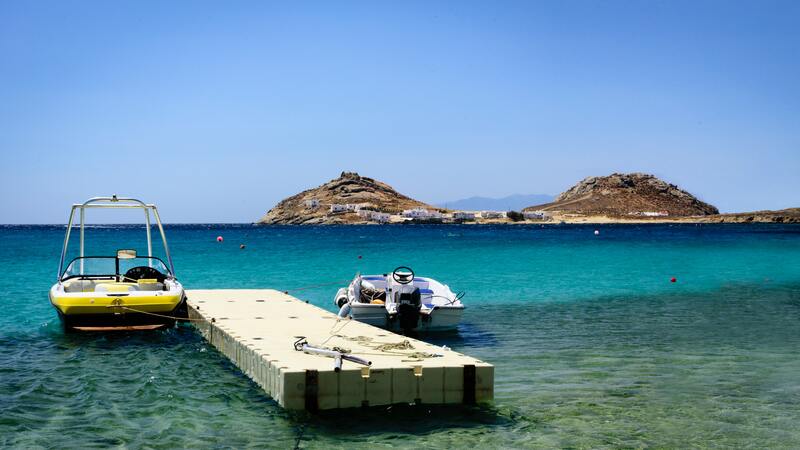 Escape the windmills, beaches and townhouses for the day with a boat trip to the archaeological island of Delos. 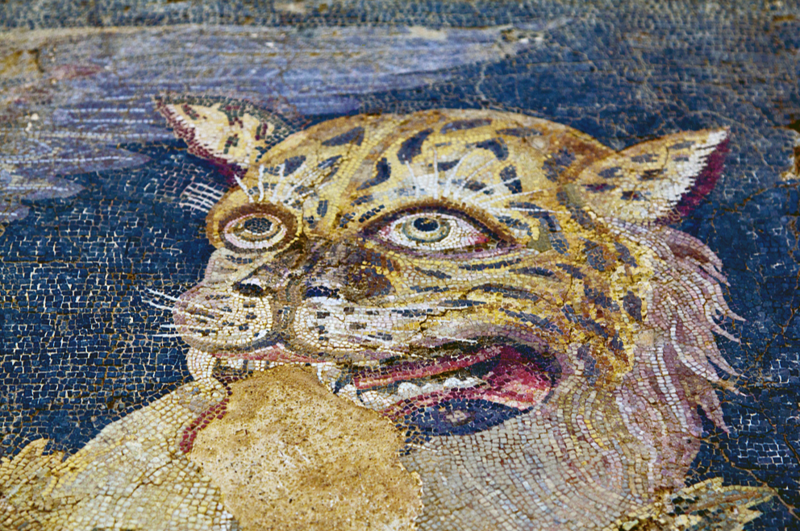 Categorised as a UNESCO Heritage Site, Delos is known as the ‘birthplace of the immortals’. According to the legend, Apollo-Sun, god of daylight, and his twin sister Artemis-Moon, goddess of night light, were born here, rendering the island sacred. Nowadays, the island is a natural insular archaeological site, no other island on Earth has as many monumental antiquities from the Archaic, the Classical and the Hellenistic periods. There’s a number of things to see on the island; the House of the Naxians, the Temple of Artemis, the Pythion, the House of Dionysos and the ancient theatre and the homes of the Delians. The Terrace of the Lions is particularly magnificent, with five of the marble lions that guarded the Sacred Palm that Leto, Apollo’s mother, held onto when she gave birth to the god of light. The Temple of Isis holds a statue of Isis, the patron goddess of sailors, and is one of the most significant attractions on the island. Originally made of wood, the island’s theatre was replaced by the stone structure seen today in the third century BC. It could hold 5,000 spectators in all and the entire area has archaeological remains, private dwellings from the time of Kleopatra and Dioscorides. Top tip: Opt for the tour when you arrive, you’ll understand each sight in much more depth. 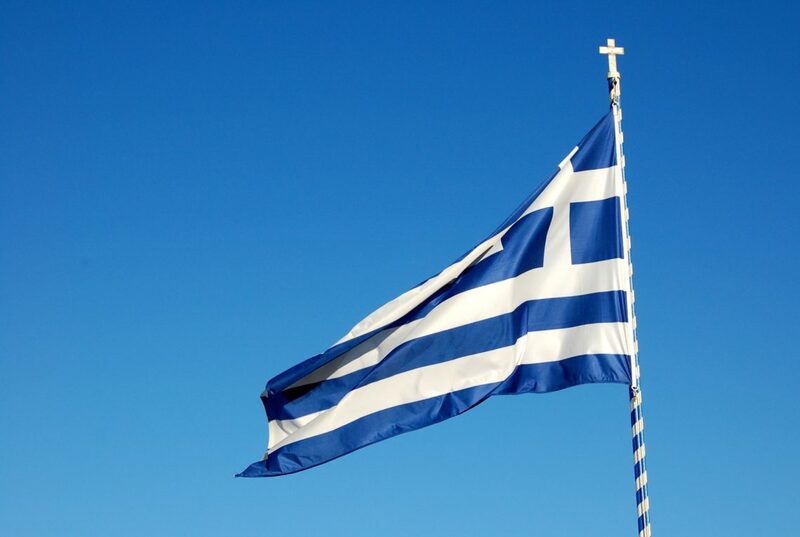 Have you got any tips from Greek holidays past? Which other Greek islands would you recommend?